We are looking for outgoing, cheerful, energetic candidates who want a dynamic experience in the fast-growing field of pre-employment screening. We employ strong leaders and offer the opportunity to network on a daily basis with Human Resources managers from a variety of organizations nation-wide. 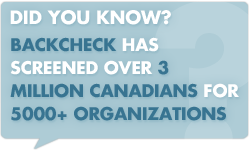 BackCheck employees conduct investigative services for some of the largest companies in Canada. BackCheck hires enthusiastic, self-motivated individuals with strong analytical and problem solving skills. Successful applicants will possess strong oral and written communication skills and will want to work in a fast-paced and professional office environment. Experience is not required and training is provided! A minimum typing speed of 40 WPM and a university degree or college diploma is required. We are accepting resumes now! For more information about career opportunities, upcoming career fairs we’ll be attending, co-op opportunities, and benefits of joining the BackCheck team, visit our Facebook Careers page.